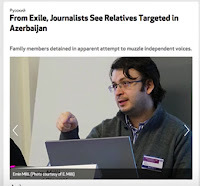 Check out this short video, A Message from Exile, by Emin Milli, well known for being jailed for his blogging and journalism in Azerbaijan, and now running Meydan.TV from exile in Berlin, which features reporting in English, Russian, and Azerbaijani. Emin's brother-in-law has been arrested since his exile, and his family have been compelled to write letters to the President of Azerbaijan, Ilham Aliyev, disowning Emin. The video includes interviews with Azerbaijani journalist Khadija Ismayilova, a Radio Free Europe/Radio Liberty journalist known for her investigative reporting into the secret millions of the ruling family of President Ilham Aliyev. Speaking before her arrest, she says in the video that if they are not happy with her writing about their financial interests, they should "stop stealing". "I have been warned several times, I am not afraid," she says. "It’s not my wish to be arrested, I don’t want to be arrested, but I know that it might happen. If that’s the price for being free, ok, but I feel free." Khadija was arrested in December 2014, and is now serving a seven-and-a-half year sentence. Khadija is one of many journalists - and civil society human rights advocates - who have been arrested on trumped up charges of fraud, tax evasion, abuse of power, and in some cases treason. Many of them are known personally to all the founders of New Diplomacy, and we know the depth of their integrity and their commitment to promoting democracy and civil liberties in Azerbaijan. 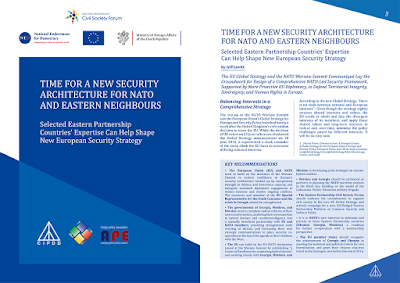 They include internationally respected election monitor Anar Mammadli, whom we nominated through the Eastern Partnership Civil Society Forum for the Václav Havel Human Rights Prize in 2014. During the term when Azerbaijan chaired the Council of Europe, Anar was awarded the prize by the Parliamentary Assembly of the Council of Europe (PACE), in partnership with the Václav Havel Library and the Charta 77 Foundation, on 29 September 2014. He was given a five-and-a-half-year prison sentence in May 2014, essentially for having reported impartially on the fact that elections in Azerbaijan are neither free nor fair. Others, such as human rights campaigners Rasul Jafarov and Leyla Yunus, and human rights defender and lawyer Intigam Aliyev, all serving similar sentences, were arrested largely due to their advocacy for the release of other political prisoners. The prize we would all most like to see is of course the release of the more than 100 political prisoners in Azerbaijan. For more on the situation facing these brave individuals, click here. But do check out and circulate the link to Emin's seven-minute video, which really sums up the tragic situation so many journalists and their families are facing: A Message from Exile. Leyla Yunus was released on 9 December, which is welcome, not least given her worsening health while in prison. But the government must release all the political prisoners, all decent people standing up for the right of Azerbaijanis to justice, to free and fair democratic elections, and to the freedom of assembly and expression. 16 December 2015 marks the two-year anniversary since Anar Mammadli was arrested and imprisoned for speaking the truth: that the 2013 elections were neither free nor fair. We need more voices like Anar, and need to continue calling for the release of him and other brave defenders of human rights and civil liberties.